Dotted with emerald sugar cane fields and surrounded by silver sands, azure waters and beautiful coral reefs, this tiny tropical paradise island, located 890km east of Madagascar in the middle of the Indian Ocean, has the most competitive and booming economy on the African continent. Mauritius spans 2,000 km2 and is home to over 1.3 million people, an ethnically and religiously diverse mix of Indian, African and French heritage. English is the official language; however, Creole, derived from French, is the most widely spoken. A former Dutch, French and British colony, Mauritius achieved its independence in 1968 and became a Republic in 1992. The country attracts nearly a million tourists annually. 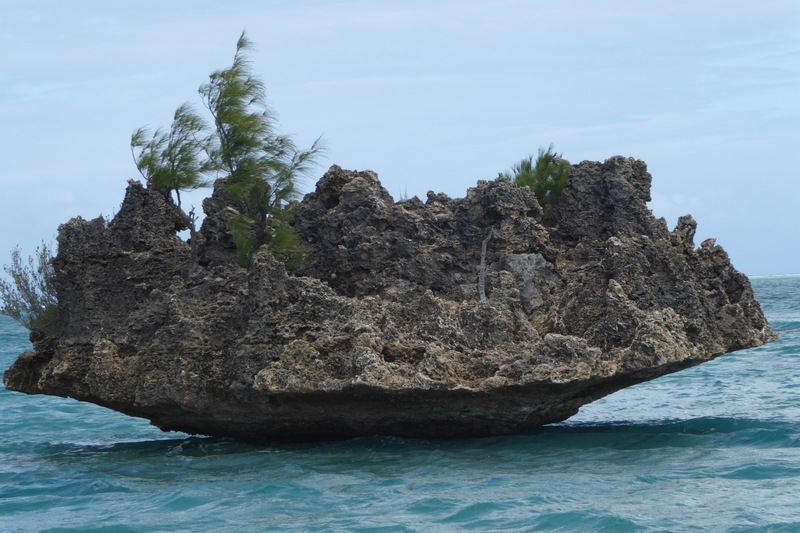 In Nature Geoscience in 2013, Torsvik and co-workers published their findings on Mauritia, a submerged continent in the Indian Ocean, between Madagascar and India. At some time in the last 2 billion to 600 million years, Mauritia was an archipelago that separated from Madagascar and the Indian sub-continent. Slivers of Mauritia may today be preserved in two chains of sub-sea mountains, one extending from Réunion through Mauritius and up to the Seychelles in the western Indian Ocean, and a second one from Chagos through the Maldives and the Laccadives up to the Indian coast in the northern Indian Ocean. Photo credited by L. Amundsen using the GEBCO 2014 bathymetric grid On our trip to Mauritius we learnt that Norwegian compatriots recently identified remnants from another world right beneath our feet – a now submerged continent billions of years old. Mauritia, once a tiny part of the Rodinia ‘supercontinent’ prior to the formation of the Indian Ocean (Torsvik et al., 2013) is believed to have detached about 60 million years ago as Madagascar and India drifted apart, and is hidden under huge masses of lava. Continental drift, responsible for Mauritia’s downfall, also gave birth to Mauritius, as geological processes surrounded the paradise island with white sandy beaches and transparent lagoons, protected from the open sea by one of the world’s largest coral reefs. But Mauritius’ birth was more about violence and burning hell than the heaven suggested by Twain. The island rose from the depths of the Earth between nine and ten million years ago when a huge volcano built by fluid magma flows created a large, low-lying land, resembling a warrior’s shield lying on the ground. At the time, the region was a volcanic hotspot. Gigantic underwater eruptions originating in the Earth’s mantle were not uncommon, forcing magma to gush into and out of the ocean before solidifying into islands. Later, two more series of volcanic eruptions gave rise to the numerous mountains, gorges and valleys that can be seen all over the island. The youngest volcanic activity occurred 30,000 years ago. Since the days of Plato, who wrote the story of Atlantis in a Socratic dialogue about 360 BC, tales of a sunken land have been told. These have met with a sceptical response, but some have proved to be true, and scientists have long suspected that volcanic islands may contain evidence of lost continents. 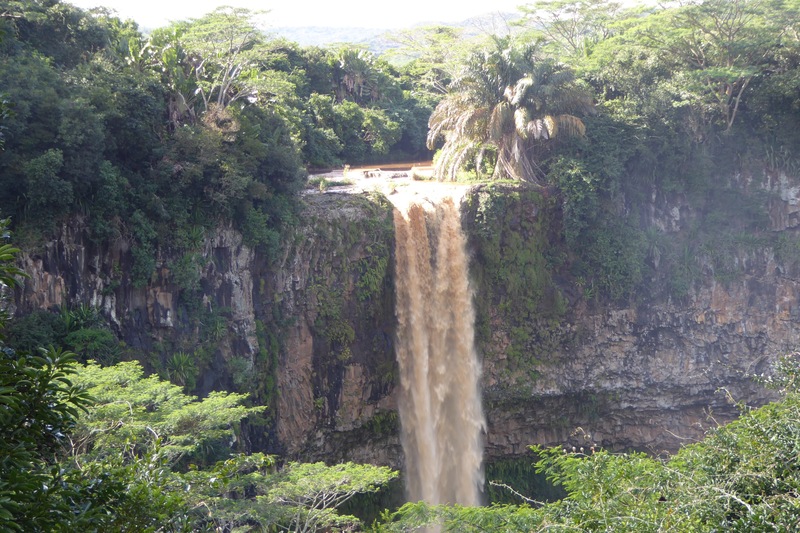 Could there be a microcontinent lurking beneath our feet, under Mauritius? The name Lemuria comes from the charming primates called lemurs, found only on the island of Madagascar and some tiny neighbouring islands. 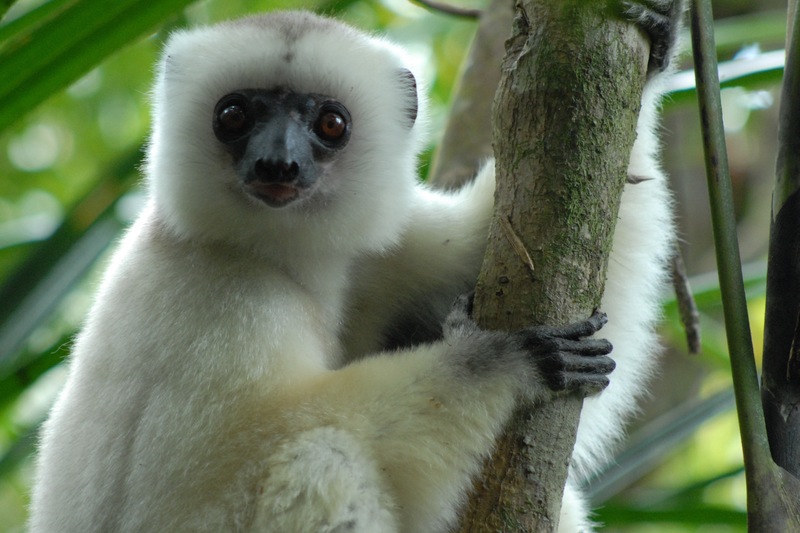 The silky sifaka, a large lemur with long, white fur, is one of the rarest mammals on Earth, and is listed by the International Union for Conservation of Nature as one of the world’s 25 most critically endangered primates. Lemuria was a hypothesised sunken continent under the Indian Ocean. In the 1860s the English ornithologist Philip Sclater found it puzzling that similar primate fossils had recently been found in the geographically isolated Madagascar and India, but not in Africa. Would these primates, which he called lemurs, have swum across the 6,000 kms of Indian Ocean from Madagascar to India, yet never attempted to swim across the shorter Mozambique Channel into Africa? Implausible; Sclater concluded that the lemurs had never swum across any ocean at all. But, he hypothesised, since they are found in both Madagascar and India, they must have walked across on a land bridge, long swallowed by the Indian Ocean. He called the sunken land Lemuria. Lemuria captured the imagination of generations of people. At Belle Mare Plage, in the north-east of Mauritius, the hotel director and islander Yash very confidently likened the story of Mauritius to the phoenix dying in a show of flames and then obtaining new life by arising from the ashes of its predecessor. However, geological knowledge eventually disproved Sclater’s hypothesis of ancient Lemuria through the theory of continental drift, proposed in 1915 by the German geologist and meteorologist Alfred Wegener, who suggested that parts of the Earth’s crust slowly drift on top a liquid core. The fossil record supports and gives credence to the theories of continental drift and plate tectonics: continents are not static but in motion. This acceptance led to the realisation that Madagascar and India were once part of the same landmass. Lemuria might never have existed but it became history’s precursor to Mauritia: a Madagascar-India land link, now hidden beneath the Indian Ocean. 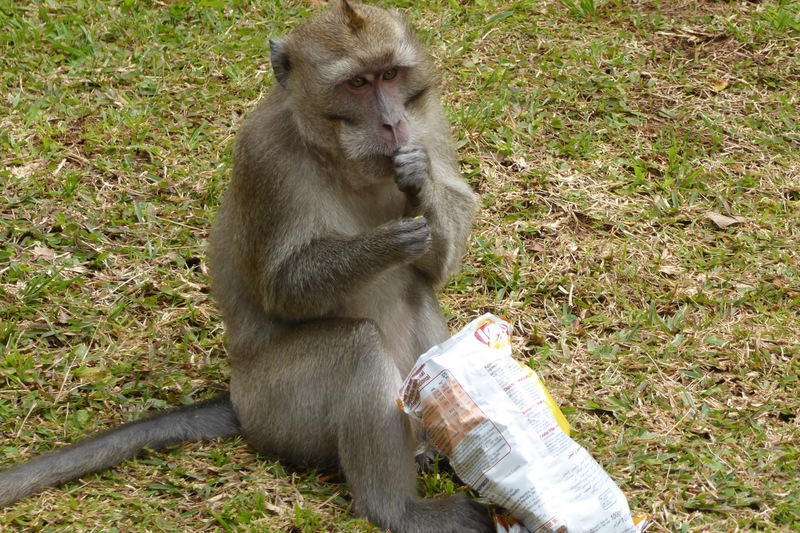 Snack time for the local "Old World" monkeys - Rhesus macaque. 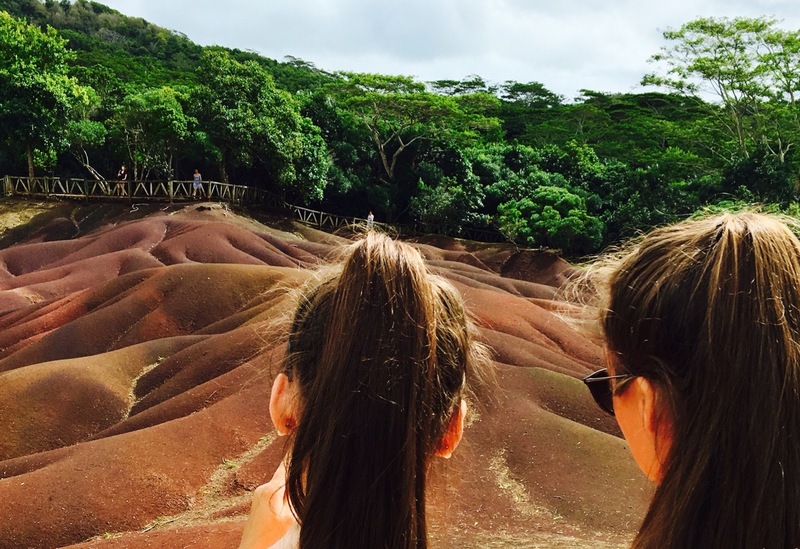 The authors admiring the vibrant colours playing out across the “Seven Coloured Earth” dunes in Chamarel, which contain traces of ancient activity of geoclimatic events. The basalt from the intermediate periodic lava flow (3-1.7 million years) has been leached by the hot and humid climate, leading to gullied clay. This profound and ultimate decomposition has left behind iron and aluminium oxides. Iron and aluminium repel each other and gather spontaneously in colourful stripes. The ferric oxide gives the land shades ranging from red to brown, while aluminium gives the blue to violet-blue colours. The leaching of the basalt has resulted in depletion of the the nutrients from the soil that are necessary for vegetation to grow. This is why no plants will ever grow on the dunes. A similar landscape also occurs in Papua New Guinea, and may be common in tropical, high-rainfall regions with volcanic bedrock. In 1999, an American scientific drilling ship discovered evidence of a submerged continent, the Kerguelen Plateau, at the intersection of the Indian and Southern Oceans. Drilling samples contained traces of 90 million-year-old pollen and wood trapped in sediments. Areas of strong gravitational fields were identified from south of the Northern Mascarene Plateau down to Mauritius, an indication of hidden submerged crusts – but were those crusts merely oceanic or were they continental? If the latter, they could be indicative of a lost continent. Zircons – tiny crystals of zirconium silicate (chemical formula ZrSiO4) – are very resistant to erosion or chemical change, and are associated with continental crust. Zircons contain ‘clocks’ by adding small traces of radioactive uranium, because uranium atoms are similar enough to zirconium that they occasionally can slip into the crystal’s lattice in zirconium’s place when the mineral is forming. The unstable uranium atoms eventually decay into lead (Pb) atoms. The age of a zircon is calculated from the ratio of radioactive uranium to lead atoms; the more lead that you find in a zircon crystal, the older it is. 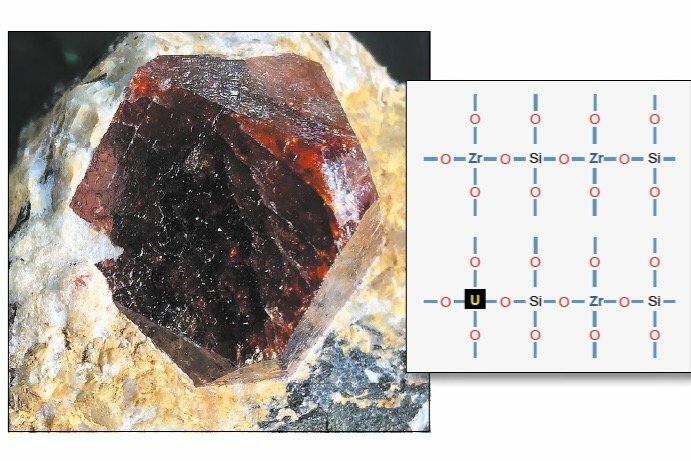 For example, zircons from Jack Hills in Western Australia have yielded U-Pb ages up to 4.404 billion years, interpreted to be the age of crystallisation. These are the oldest minerals so far dated on Earth. A group of geoscientists from Norway, South Africa, Britain and Germany, led by Norwegian geophysicist Trond Torsvik at the University of Oslo, were interested in the findings. To investigate further, they made a tectonic plate movement model to reconstruct the past history of the Earth, including the geography of continents and oceans, and the processes controlling the creation and destruction of landforms. Until around 750 million years ago, all of the land on Earth was collected into a single continent called Rodinia. This supercontinent was driven apart by tectonic forces, slowly fragmenting and drifting apart. 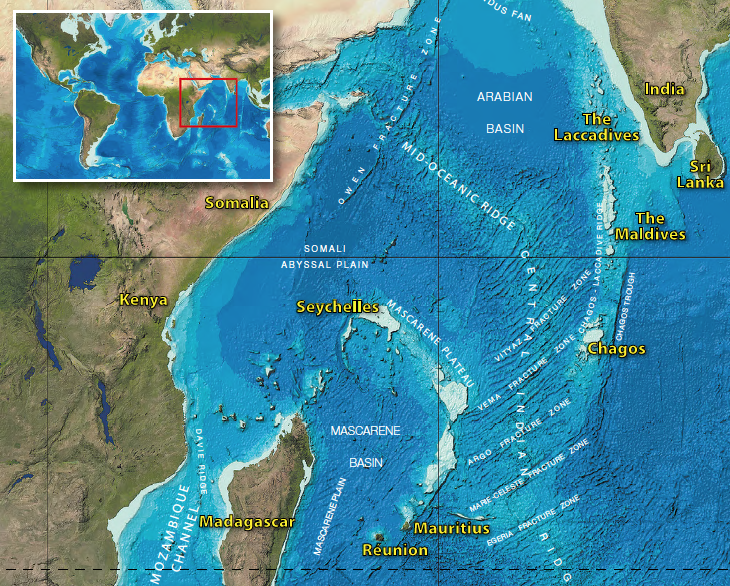 In this continental ballet, the team found that in the Indian subcontinent there was one microcontinent that about 60 million years ago disappeared beneath the waves, leaving a fractured mass of continental crust lying kilometres beneath the Indian Ocean. They dubbed it Mauritia. 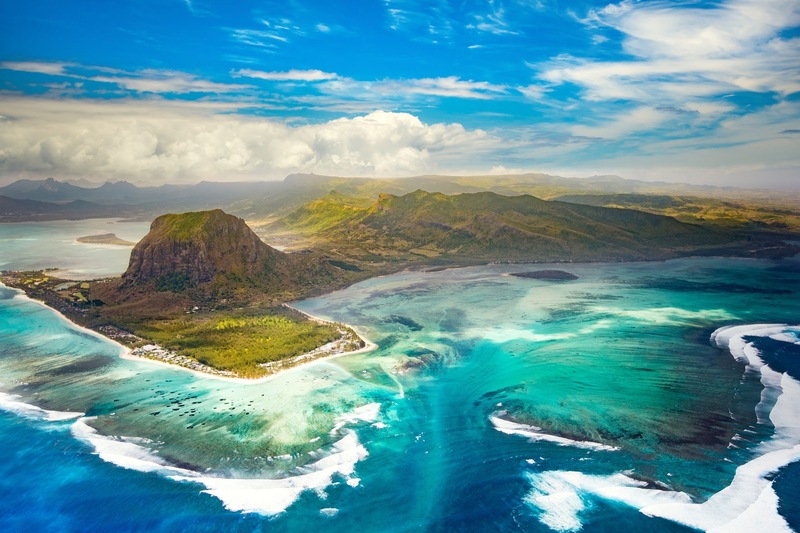 To gather more proof about the existence of Mauritia, the geoscientists set course to Mauritius, located above some of the fragments of the lost continent, hoping to find pieces of the missing land. The team hypothesised that as magma flowed up from the Earth’s interior to form Mauritius, it would drag up to the surface a few rocks containing zircon minerals from the continental crust of the sunken Mauritia. Hopefully, some super-tough grains of zircon would survive the high temperatures of the lavas and during the eruption be ‘frozen’ into them. If they did, this would leave behind some clues in the lava-made basalt land of Mauritius. They collected samples of sand on remote beaches and brought these back to Oslo, where they found 20 grains of zircon (wow!). Furthermore, they dated the zircons to be much older than Mauritius; the oldest grain was nearly 2 billion years old while the youngest roughly 600 million years old. There is no obvious local source for zircons on Mauritius, so Torsvik and his colleagues suggested that the zircons originated in the fragments of Mauritia’s ancient continental crust located beneath Mauritius. Volcanic eruptions brought shards of the crust to the surface, where the zircons eroded from their parent rocks to pepper the island’s white sands, but further research is needed to fully investigate what remains of this lost region. The ultimate proof of Mauritia and the key to new knowledge would be new seismic data that can image the structure. Maybe our friend Yash is right? Perhaps Mauritius was reborn from Mauritia. Only one beautiful phoenix exists at any one time, and it is long-lived; the same could be said for Mauritius. As the end of its life approaches, the phoenix builds a nest of wood and spices and climbs on to it. There it faces the sun, the fire ignites, and it is consumed in the flames – but after a time, the phoenix rises again from the ashes. In the same way, if Mauritius was reborn from Mauritia, then at some time will Mauritius itself die and be reborn?